Sam Shropshire returns the ball with a volley. The junior lost in straight sets during his singles match against Illinois on Saturday. 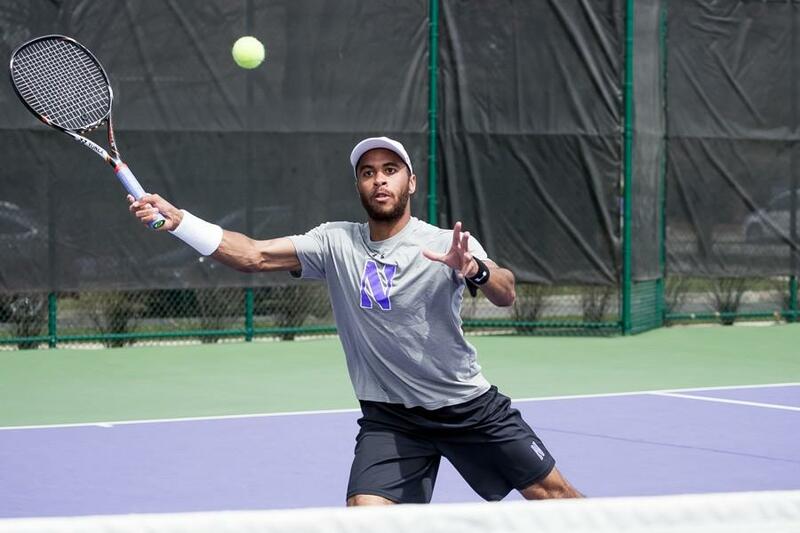 Northwestern missed a chance to go to the National Indoor Championships on Saturday by losing its first match of the season to Illinois. The No. 7 Fighting Illini defeated the No. 25 Wildcats 4-0 in the finals of the regional ITA Kickoff Tournament, which was played in Champaign, Illinois. However, NU was successful against Tulsa on Friday, defeating the Golden Hurricane 4-1. Overall, the Cats finished second of the four teams in the ITA Kickoff Event, but their two quality performances were not enough to qualify for the National Indoor Championships in Virginia in February. Illinois’ Aleks Vukic beat No. 16 Konrad Zieba 3-6, 6-1, 6-4 in the No. 1 singles match to clinch the 4-0 win for the Illini. Zieba had taken a 4-3 lead in the final set before Vukic reeled off three straight games to win the match. Along with the doubles point, Illinois won the No. 2 and No. 4 singles matches, as No. 21 Jared Hiltzik defeated NU’s No. 50 Sam Shropshire 6-2, 6-2 and Julian Childers, No. 67, defeated Fedor Baev 7-6, 6-3. While the three singles matches that finished first all went to Illinois, the Cats had impressive performances in other matches. No. 55 Strong Kirchheimer led Illinois’ No. 41 Aron Hiltzik 6-4, 4-6, 1-0 in the No. 3 singles match, and NU’s Ben Vandixhorn led the Illini’s Asher Hirsh 3-6, 6-4, 2-1 in the No. 6 singles match when the Illini secured victory. Before the tough loss to Illinois, NU defeated No. 24 Tulsa 4-1 in the opening round of the tournament on Friday to make it to the finals of their group stage. The Cats secured the first point of the match with doubles wins from its No. 1 and No. 3 teams. Baev and Kirchheimer won the No. 1 doubles match 6-3, and Alp Horoz and Mihir Kumar won the No. 3 doubles match 6-3 to clinch the point. Zieba and junior Strong Kirchheimer led the way for NU, as Zieba won the No. 1 singles match 6-4, 6-2 over Tulsa’s No. 51 Or Ram-Harel. Kirchheimer, in addition to his doubles win with Baev, won the No. 3 singles match 7-6, 6-3 over Majed Kilani to secure the team match for the Cats. Zieba and Kirchheimer were backed up by a win from Baev, who defeated Matthew Kirby 7-6, 3-6, 6-2. Correction: A previous version of this story misstated the day of the week Northwestern lost to Illinois. The Wildcats lost on Saturday. The Daily regrets the error.